… it’s a 12,000 lb. steel beam! Yes, that’s right! 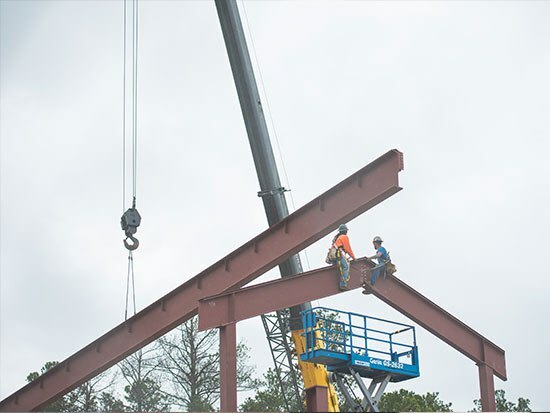 Yesterday, our team enjoyed witnessing the largest piece of construction material go into place in the chapel. We’ve been talking about this moment for the last several weeks because it represents a start of a significant chapter not only in this expansion project, but also in the life of our church. The chapel is a highly anticipated part of this project as it will become a central hub for several different ministries in our church to grow and flourish. COLLEGE MINISTRY – If you happen to arrive any time during the College Collective class that meets between 9:15 – 10:30 am each Sunday, it’s not unusual to find a packed room and even chairs of students spilling out into the lobby. The new chapel will be a new setting for our college ministry to gather each Sunday and hear God’s Word, ask questions, and experience community together. CHAPEL HILL BIBLE CHURCH EN ESPAÑOL – Did you know that we host a worship service in Spanish? Latino Director, Gaby Correa, organizes a worship service each Sunday for a growing number of people who only speak Spanish. As they continue to grow, they’ll eventually outgrow the largest space we can offer, so we’re excited to see this ministry find its new home in the chapel this fall. That’s not all, but you get the point. We’re eager to see how God moves in this new space to equip our church as a community to reach the Triangle and beyond with the message of Jesus. Aren’t you?